It’s Homebuying Season – Get the Checklist | ASTRALCOM - Content Strategy, Conversion Marketing and Customer Acquisition. 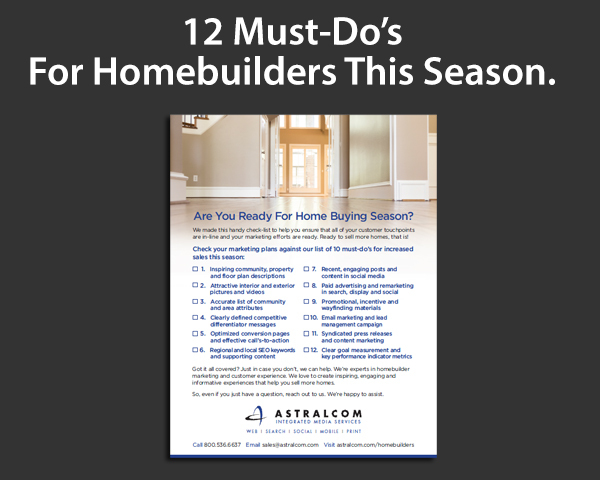 It’s Homebuying Season – Get the Checklist | ASTRALCOM – Content Strategy, Conversion Marketing and Customer Acquisition. This year, everyone is smarter. Homebuyers are smarter in how they choose homebuilders. Homebuilders are smarter in how they connect with homebuyers. With other builders courting the same buyers that you are, it’s going to be a lot more competitive, this year. Think you’ve got it all covered? Check your marketing plans against our list of 12 must-do’s for increased sales this season. If you’re missing something from the Top-12 list, we can help. We’re experts in homebuilder marketing and customer experience. We love to create inspiring, engaging and informative experiences that help you sell more homes. So, even if you just have a question, reach out to us. We’re happy to assist. Get the details and the the checklist, click here.